On 7 and 8 July 2017, the eyes of the world will turn to the G20 Summit in Hamburg, where the Heads of State and Government of major industrialized and emerging economies will meet. I am very much looking forward to welcoming the G20 partners to the city of my birth. Mastering and shaping the global challenges of our age is a common goal of the G20. The success of the summit will depend significantly on the progress we make towards achieving this objective. Where is the world economy headed? Many current developments give us cause for concern. The development of the world economy is not keeping pace with expectations. It is worthwhile taking stock of the G20’s beginnings, as well as the global economic and financial crisis some ten years ago. The G20 revealed its strength in these times of crisis. At the height of the economic and financial crisis, we collectively expressed our support for allowing competition to shape the world economy and for ensuring that world trade remained open. The G20 countries moved closer together in these times of crisis and developed shared mechanisms without resorting to protectionism. The experiences of the crises of the 1930s were a lesson to us that we must not forget. As G20 partners, we must ask ourselves what we can do to ensure that everyone stands to benefit. How can we cooperate better in the future for the sake of our citizens? What fears and challenges are associated with globalisation, and what can we do to address these? How can we safeguard inclusiveness and ensure that the fruits of prosperity and growth are distributed fairly? The G20 must demonstrate that it stands together. We are mutually dependent on each other – and not only economically and in the area of financial markets. The G20 is an informal cooperative forum founded on shared values. It provides us with a high-visibility framework, promotes our mutual exchange and reinforces our commitment to common principles. We can achieve more together than by acting alone. Strong international organisations are indispensable alongside this informal exchange. I want to work with the G20 to promote this. Alongside stabilising the world economy and financial markets, numer- ous global challenges are on the G20’s agenda, including geopolitical conflicts, terrorism and migration and refugee flows, as well as hunger, increasing climate change and pandemics. These challenges will certainly not be mastered by countries plotting a lone course or by isolationism and protectionism. There can be no return to a pre-globalisation world. Only together will we be able to drive forward our objective in the G20 – strong, balanced, sustainable and inclusive economic growth – by addressing economic, social and political uncertainties in concert. 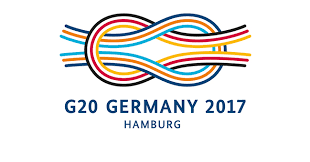 In doing so, the G20 contributes significantly to strengthening the stability and resilience of the world economy and, last but not least, to increasing security for each and every one of us. Let us turn our focus to digitalisation, which helps our world to grow together, reduces distances thanks to technical progress and brings people into contact with each other as never before. At the same time, the G20 must address the impact of technological progress. This is the only way to fully harness its potential. The G20 must shape the basic conditions in such a way that all people are able to benefit from the positive effects of these developments. The digitalisation of our world is only one example of its strong and increasing connectivity. In our efforts to achieve an effective climate protection policy or global health crisis management, too, we can only move forward in close cooperation with one another. I would like to hold a broad-based civil society dialogue on these issues involving all societal groups. I have invited representatives of the business sector, NGOs, trade unions, academia and think tanks, as well as from women’s and youth organisations, to draft recommendations for the G20. This input from civil society is important for the G20’s discussions.